This was a wonderful little apartment and we felt very safe! It was a perfect location, close to shopping, attractions and cafes. The bed was a little uncomfortable and the pillows were flat but that was easy to forgive with everything else the rental had to offer. I would absolutely stay there again! 5 Star in every respect! This is one of the best located, designed and equipped apartments we have stayed in. It has an iconic view, and is 5 star in every respect. It is well connected to the airport and the Paris Metro system, and is on the edge of the lively Marais district. Just two things to be noted. The apartment is two floors up, with no lift, and is on a busy road. Double glazing reduces the noise very substantially, but those needing complete quiet might prefer somewhere else. This is a wonderful apartment in a great location! The apartment was well furnished - dishes, towels, even some welcome food! The metro is only 30 feet from the front door of the building, and you can see Notre Dame from the windows. It was a great trip to Paris! We loved our stay at this apartment. There were 3 of us and it was perfect. Great location just steps to the metro. Convenient to shopping and restaurants. The owner was helpful and made out stay in Paris spectacular. The couch folded out was very comfortable to sleep on. We felt safe and secure in the neighborhood and enjoyed people watching. I WAS PLEASED IN ALL WAYS, LOCATION WAS GREAT, OWNER VERY HELPFUL, LOCATION WAS TERRIFIC AND UNIT WAS WELL EQUIPED AND VERY CLEAN. I WAS A LITTLE CONCERNED ABOUT NOISE FROM BUSY RUE DE RIVOLA BUT WASN'T A PROBLEM. MY ONLY COMPLAINT IS THAT I WOULD HAVE LIKED THE BED TO NOT BE SITTING ON THE FLOOR...RAISED FRAME WOULD HAVE BEEN NICE AS GETTING IN/OUT WAS A BIT MUCH. LOCATION AND VIEW AND COMFORT OF THE APT MADE OUR VACATION THE BEST EVER! My husband and I have travelled often to England and Ireland, but this was our first trip to Paris. From the start, I wanted a location that would make it easy for us to walk where we wanted, have easy access to public transport if we needed it, feel like we were locals in Paris and not just another hotel room AND have a view of something spectacular. I'm happy to say that the Rivoli Apt delivered on all counts, and more. And oh, I forgot: THE OWNERS! Jean-Michel, Nicole, their daughter AND son-in-law all made us feel welcome and were available by phone (free call from the apt) to help us at every turn if we needed anything, and also requested a call just to find out if we were okay when we got there. Deal with Jean-Michel knowing that he is honorable and attentive, but NEVER intrusive. He has three apts which can be let all together or individually for incredible options. We loved our home away from home, lacked for nothing and appreciated our accommodation more and more as the trip progressed. We threw open the floor to ceiling windows and felt right in the heart of Paris, stunned by the view and the activity on one of the busiest streets in Paris. Happily, when the windows are closed, it is completely quiet and calm with just that exquisite view remaining. (It's exactly as represented in the photos!) We were mesmerized by watching the light change on the Place de l'Hotel de Ville and Notre Dame in the distance. We had easy access to fresh foods, vegetables, breads, restaurants, fun shopping (not the serious expensive kind, although I'm sure it was there), street markets and cafes. Go LIVE in Paris, not just visit. Don't try to see every famous place in one trip. Have your coffee while the sun comes up on the plaza, sitting in front of one of those grand French windows in your plush Terry robe (provided by your host). Even though eating out is almost always delicious from the simple fare to more elaborate dinners, do take advantage of the fresh markets and cook at home some. The kitchen has everything in the most ingenious, economical fashion. You'll have quality cookware, crystal stemware, beautiful dishes and ample prep tools. I can't say enough about all that goes into the comfort and convenience of the apartment, while losing nothing of the charm factor. Oh, and there's a tv, internet, iPod docking station, and such, but we didn't need a thing but that view. Go. Go now! My sincere thanks to the entire Picq family. They know how to do this! We thank you for your excellent review of our apartment and services, and are very happy to learn that you are fully satisfied. We hope to see you again, or your family or friends, in future. The 'Rivoli' is Situated on the 'Place de l'Hôtel de Ville' (the Town Hall Square) in the 4th arrondissement. The Marais (showbiz chic residential area), the Halles (covered cinema and shops) and Notre Dame Cathedral are very nearby, as are Many museums, Such As the Picasso Museum, the Louvre, or the Pompidou Centre. The pedestrian walkways, cafes and famous With Their restaurants, and the BHV department store, A Few are only yards away. 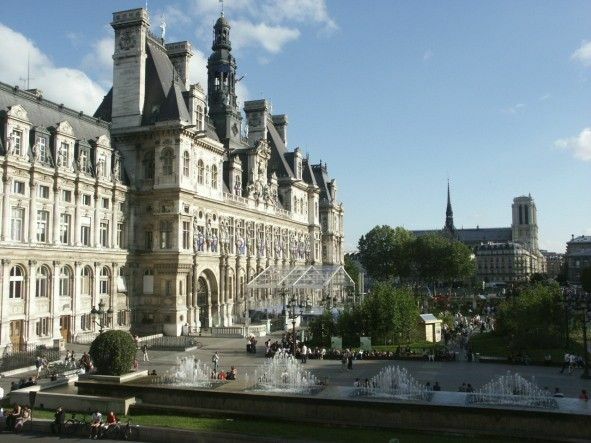 The City Hall '(Town Hall) metro station links the Champs Elysées, the Defense (modern business center), and the Gare de Lyon Train Station.